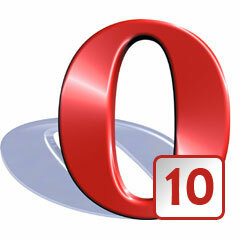 The Opera browser has continued to evolve and version 10 will be released shortly. Version 9.8? What’s going on? Opera is one of the oldest browsers and is the first to approach a double-digit version number. Unfortunately, the Opera developers started to experience strange problems with a selection of sites that use browser sniffing to serve version-specific content and/or scripts. Many of the sniffing scripts simply detected the first digit in the user agent string and boldly assumed they were running on Opera 1 rather than Opera 10. Worse still, many of these sites decided that the browser was unsupported and refused to provide any content. The Opera team deliberated the site compatibility problem and came up with the best compromise: freeze the first part of the string at 9.80 but append the real version number to the end. v9.80 was chosen rather than v.9.99 just in case there is a need to update the initial version number at a future date. Would the original Opera 10 user agent string have affected any of your websites?